Why is it that supporters of live music cannot do unto recorded music as they would have done to themselves? Last month saw the publication of the UK Live Music Census, which offers an excellent examination of live music in Britain. This campaigning document has a tightrope to walk. On the one hand, it wants politicians to listen. Therefore, it makes a case for the great economic value of live music. The sector is described as ‘one of the real success stories of the past decade’. Seeking to confirm this, the census focuses on three towns, calculating the millions of pounds that their live music scenes contribute to the UK economy as well as the thousands of jobs that they provide. On the other hand, the report is concerned about an industry under threat. It is particularly focused on small venues and the ‘“perfect storm” of issues at present which is affecting their long-term viability and sustainability’. And it wants to campaign for remedies. The activism in this sector has been worthwhile. The introduction of ‘agent of change’ legislation is a case in point. One factor that has affected British venues in recent years has been a rise in noise complaints, particularly from the occupiers of new buildings that have been erected in town and city centres. Live music activists have encouraged the British government to introduce this new legislation. The principle of ‘agent of change’ is that ‘the person or business responsible for the change is responsible for managing the impact of the change’. In respect of live music, this means that property developers have to bear the soundproofing costs if they construct new apartments near existing venues. Conversely, if a new venue opens in a residential area, it would have to pay for any soundproofing required. The UK Live Music Census adds weight to this cause by undertaking a comprehensive, detailed and thought-provoking survey. In addition, its data and feedback prompt further recommendations for the government and local authorities: business rates should be addressed so that small venues do not face crippling and disproportionate increases; licensing laws should be amended so that younger audiences are able to attend gigs at these venues; parking restrictions should be liberated to ensure that bands can load and unload their gear; venues should be funded to help preserve the Britain’s live music traditions. Many of the respondents commented on the difference between the live music and the recorded music experience, often to say that the former is somehow ‘better’ than the latter. For some, this is because of the uniqueness of the experience, because unlike with recorded music, the performance is different each time. The uniqueness of the performance also means that in an increasingly mediated world, the experience is authentic; it cannot be repeated. Part of the reason for this sense of unrepeatable authenticity is because the performer-audience interaction is a fundamental part of the experience. The live music event allows audiences to inhabit the same physical space as the artist, sometimes even to meet them in person. In addition to its social bias, the UK Live Music Census is partisan when it comes to music’s economic worth. It proclaims the victories of live music at the expense of the record industry. The report notes that ‘Live music revenue overtook recorded music revenue in the UK in 2008’, referencing a PRS for Music report by Will Page and Chris Carey, and adds that ‘since 2014 UK Music has published figures in its now annual Measuring Music report that appear to suggest that live music is now consistently the largest generator of revenue in the UK’s music industries’. Live music income has definitely grown in this century and the fortunes of recorded music have declined. Nevertheless, as I have written elsewhere ('Sympathy for the Mechanical' and 'Measuring the Measuring'), the economic comparisons that have been drawn between the two sectors are problematic. The PRS for Music reports do not compare like with like. Their recorded music figures are restricted to business-to-consumer ‘payments for physical music products, downloads-to-own and subscriptions’. Their live music totals are more expansive. As well as documenting the income from ticket sales by agents and venues, they include secondary ticketing and ancillary spend. The UK Music figures can be questioned too. Although their recorded music totals do include business-to-business income, they are still narrow in comparison to the live music figures, which feature the ‘total spend’ at gigs and festivals (including food and beverage sales, merchandise, parking costs, camping fees, etc.) as well as total ticket sales and the sponsorship of events. These live music figures also include the income of music promoters, music agents, production services and ticketing agents, whereas the income for retailers and distributors is discounted from the recorded music figures. Moreover, UK Music does not, in fact, posit the live sector as generating the most income. This accolade goes instead to ‘musicians, composers, songwriters and lyricists’. How are these artists getting paid? The UK Live Music Census adds some distortions of its own. Its authors argue that ‘live music is now more economically significant than recorded music for musicians’. The results from their questionnaire show that professional musicians earn, on average, 49% of their income from performing, 3% from recording, and 4% from composing; semi-professionals earn 23% from performing, 2% from recording, and 1% from composing; and that amateurs earn 23% from performing, 2% from recording, and nothing from composing. It is wrong, however, to suggest that these figures are indicative of musicians as a whole. The census took place at live music venues. What would the answers have been if it had been compiled at recording studios or at songwriters’ bootcamps? In a similar manner, the authors argue that ‘the census data suggests that spend on tickets for live music events now forms a greater proportion of consumer spend on music than recorded music’. Their figures demonstrate that 47% of respondents spent more than £20 on tickets for concerts or festivals each month and that only 25% spend the same amount on recorded music. But the authors were asking people at gigs. It is doubtful that the figures would have been the same if they had been compiled in record shops, or even if they were solicited from people in the comfort of their homes. Moreover, while these comparisons are unfair on recorded music, they also say little about live music’s economic dilemma: how to account for the discrepancy between the economic riches of the live music sector and the economic woes of many of those working in the field? 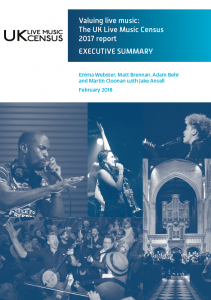 Although the report is centred on small venues, it has room for concern about promoters, 50% of whom complain that ‘the cost of paying bands had an extreme, strong or moderate negative impact on their events in the past 12 months’. However, these musicians also have monetary troubles. Although the census report maintains that live music income is more important for musicians than their advances and royalties, the findings also demonstrate that 68% of musicians have encountered ‘stagnating pay’ for their gigs and find it difficult to bring in a viable income. On top of this, two-thirds of musicians have performed for no fee in the past 12 months, while 16% have been asked to pay to play. The report pays less attention to those who are prospering from live music. Moreover, it does not suggest that they should help fund the venues, promoters and musicians who are suffering from low rates of pay. Instead it asks for ‘the wider music industries (including recording and publishing, possibly via the UK Music network) to support musicians and smaller venues beyond current support; for example, by subsidising emerging artist fees and/or providing venue infrastructure’. And so recorded music has its uses after all. The suggestion is not unwarranted. Record companies probably should provide support for live music. The fortunes of the two fields should not be contrasted; they should instead be viewed as intertwined. Live music continues to drive the sales and use of recordings, just as recorded music continues to drive ticket sales for gigs. This should not however absolve the live music industry from its own responsibilities. As the census notes, ‘the largest entertainment company in the world, Live Nation Entertainment, owns both the largest live music promoter in the world, Live Nation Concerts, and the biggest ticketing company in the world, Ticketmaster’. Its CEO Michael Rapino is number one in Billboard’s notorious power 100 for 2018, marking him as the leading figure in the music industries. Maybe it’s time to phone him up and ask him for some wealth distribution.